From January 16th to the 22nd at the Tokyo portrait gallery, close to Yotsuya station, members of the Noh Theatre Photographers Association 能楽写真協会 will exhibit pictures collected under the theme ‘Heike zanshō’ 平家残照, or ‘Afterglow of the Heike’. The title refers both to the Taira clan (aka Heike) and to the Heike monogatari, the warrior epic describing the rise and fall of the Heike, and the struggle with the rival Minamoto clan (aka Genji). The photographs portray scenes from the many plays featuring characters (mostly, but not only, warriors) from the Heike monogatari appearing in Noh plays such as Michimori, Yashima, or Hashi Benkei. What about Noh photography? Just yesterday I was having a twitter conversation with a young Noh professional and a young Noh amateur on the role of ‘creativity’ in traditional performing arts. Noh photography pretty much follows the ‘rules of tradition’. Since Noh photographers are, for better or for worse, part of the Noh establishment, hence they are subject to its rules. Naturally, in order to take photos of a Noh performance it is necessary to get a permission from the performer, who is in turn responsible for the photographer’s presence in the theatre. Usually there is an agreement between the two parts, with the photographer complying with the wish of the actors in order to be allowed to take pictures. This does not necessarily mean that the performer is forcing on the photographer, simply because in most cases the photographer shares the same aesthetic taste of the actor, that is, an aesthetic that is inscribed in tradition. Let me elaborate this. Like all traditional arts, Noh dance is based on sequences of kata 型, or ‘choreography clusters’ prescribed by tradition, which are transmitted from teacher to pupil, and reproduced on stage. Kata are combinations of movements that have a beginning, a development, and a conclusion, and aesthetic value is attached to how beautifully the kata is executed. Since a kata is a movement, its beauty depends on various kinetic factors – how to capture this in a photo? Oftentimes Noh photographers (especially those belonging to the association I am referring to in this post) tend to shoot pictures of a static instant within the kata (often the conclusion) where the actor freezes, sometimes only for a brief instant, on a certain pose – something that kabuki has developed further in mie techniques. Traditionally, Noh photos are shots of ‘still’ kata, and may result in a rather static effect. (See an excellent exception). Since ‘professional’ Noh photographers know the plays very well, they wait for the ‘highlight’ of a scene and then shoot. Obviously actors are aware of this, and make sure to keep the pose long enough for photographers to catch it. I’m not suggesting that actors act for the photographers, but I am pretty sure there is awareness of that, too. 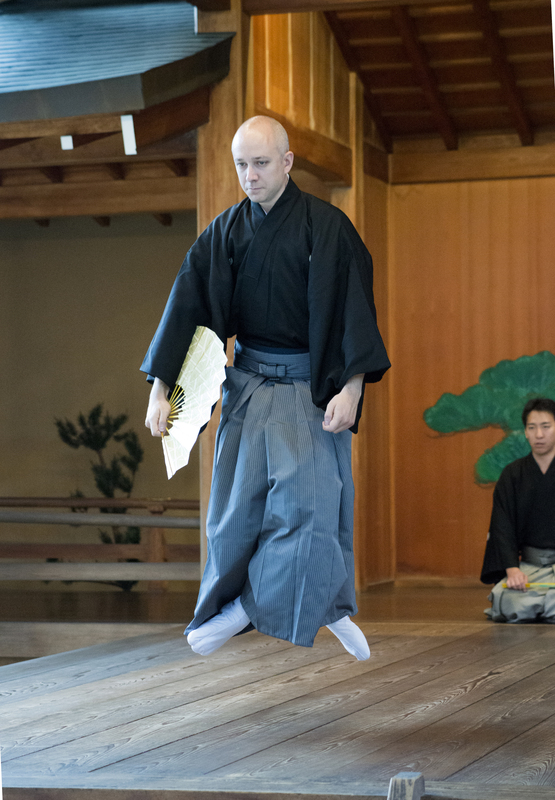 I am reflecting on Fabio Massimo Fioravanti‘s pictures of Udaka-sensei he took during his trips to Japan in the past two years. Massimo is not a ‘Noh photographer’ per se, meaning that 1) he was not educated in Japan, 2) he is not a Noh specialist. This provides him with a very different perspective of the stage, which of course is very interesting. Many of his pictures lack the static composition of traditional Noh photography, resulting in a ‘rougher’ yet ‘true-to-life’ effect, something close to what you can see in my picture above. During the editing process of the photo book he is about to publish, we have skimmed through hundreds of pictures, confronting his preferences with those, more used to traditional Noh photography, of Udaka-sensei himself. The result is a compromise between Massimo’s point of view, generally disregarding the perfection of kata, but looking for dynamism and intensity of expression of the overall frame, and Udaka-sensei’s point of view, more concerned with the photo’s capacity to reproduce his idea of formal perfection of his acting. I will make sure to post more about Massimo’s forthcoming book as well as about Noh photography in general (I did a bit already here). There’s a lot more to say!